Interview offers insight into ‘watershed / stream’ approach: What makes BC’s stormwater approach different than other jurisdictions in North America? 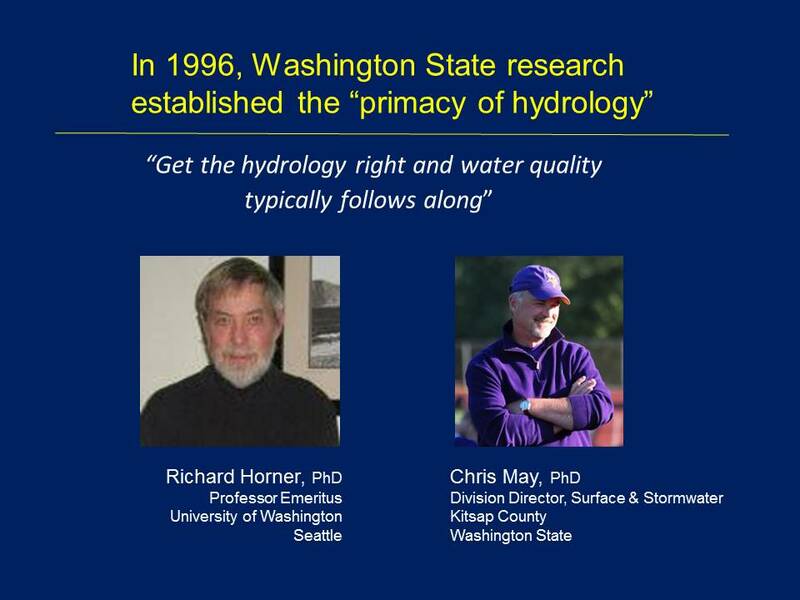 In May 2016, writer James Careless interviewed Kim Stephens and Jim Dumont, two experienced water resource practitioners, about the hydrology-based approach to rainwater (stormwater) management that has been evolving in British Columbia over the past two decades. The British Columbia approach, with its emphasis on the water balance, contrasts with a water quality oriented approach in the rest of Canada. James Careless posed a set of five questions, with the objective of informing a national audience about what makes the BC approach different. Kim Stephens is the Executive Director, Partnership for Water Sustainability in British Columbia. Jim Dumont is the Partnership’s Engineering Applications Authority. 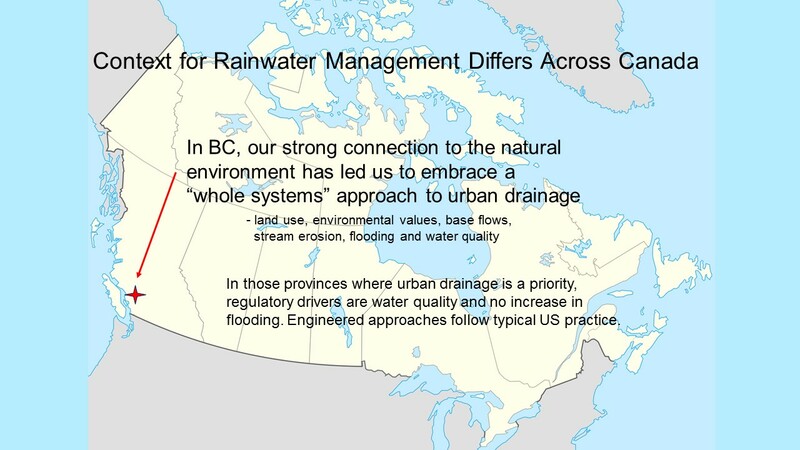 What makes BC’s stormwater approach different than other jurisdictions; particularly the U.S.? Why did BC take this different approach? What is the fallout from only focusing on water quality, as opposed to the impact on eco-systems as well? What are the challenges in implementing BC’s approach? Are other jurisdictions doing something similar to BC? Q1 – What Makes British Columbia Different? “The difference in British Columbia is that the stream is included in the Water Balance Methodology, whereas many other jurisdictions simplify the problem to the site of the development, with an emphasis on creating rainwater gardens and similar measures to infiltrate and reduce surface runoff volumes,” explained Jim Dumont. 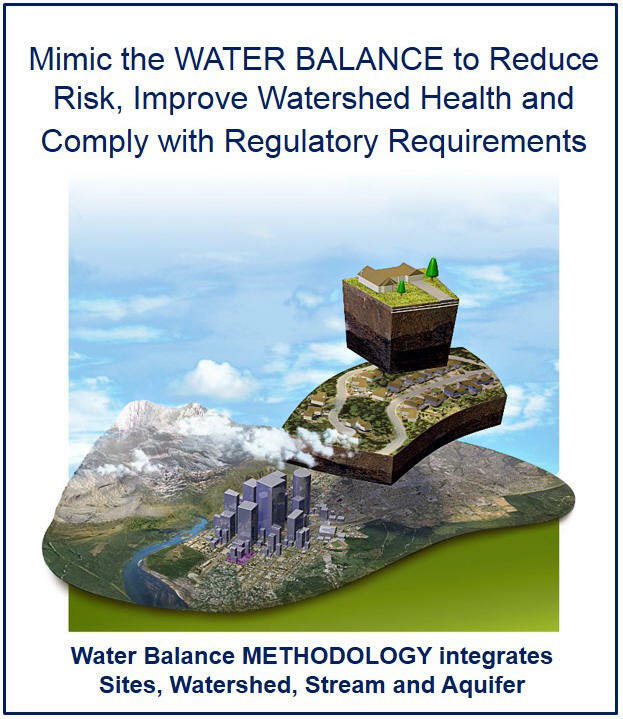 “The objectives of the Water Balance Methodology start with the stream and end with the stream, providing a true measure of success in achieving environmental protection,” emphasized Jim Dumont. Q2 – Why did BC take this different approach? “We were focused upon the loss of salmon in our streams and built on the science and research from Washington State. The research established that the loss was due to damages to habitat resulting from ‘changes in hydrology’ and stream erosion that result from urban development, rather than toxic pollutants,” stated Jim Dumont. Q3 – What is the fallout from only focusing on water quality, as opposed to the impact on ecosystems as well? “The loss of aquatic habitat and fish populations resulting from urban impacts to streams is ignored when the focus is solely upon runoff water quality. This will result in the ongoing loss of fish populations and aquatic habitat in clean urban streams,” answered Jim Dumont. 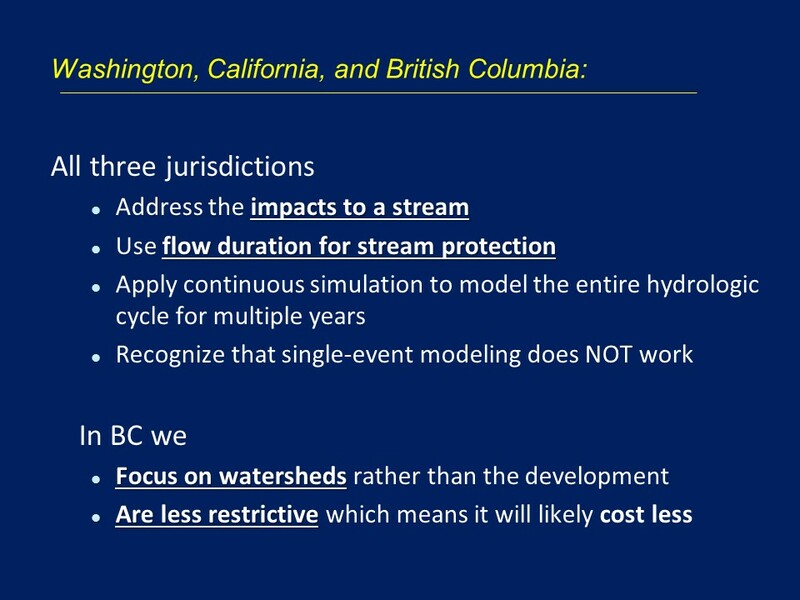 “Awareness of shifting baselines in BC has been reflected in a number of landmark processes, with the most recent being the Water Sustainability Act (2014),”: noted Kim Stephens. 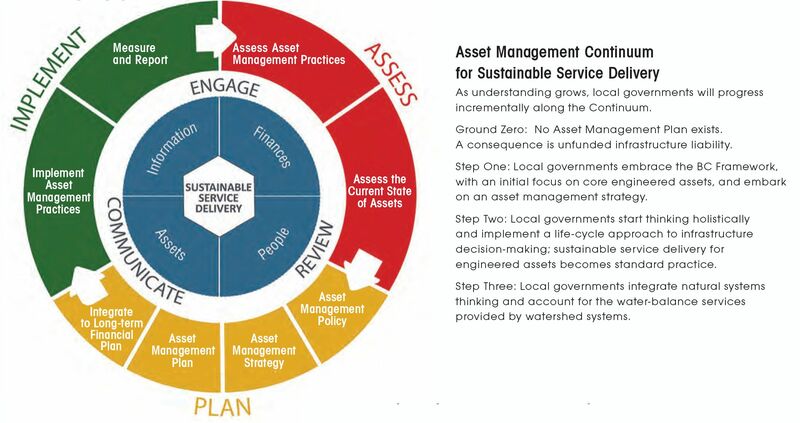 Q4 – What are the challenges in implementing BC’s approach? “The principal challenge is in widening the view of regulators and practitioners to include the stream and aquatic habitat when it is so easy for them to focus solely upon the development site and creation of rain gardens to reduce surface runoff,” stated Jim Dumont upon reflection. Q5 – Are other jurisdictions doing something similar to BC? 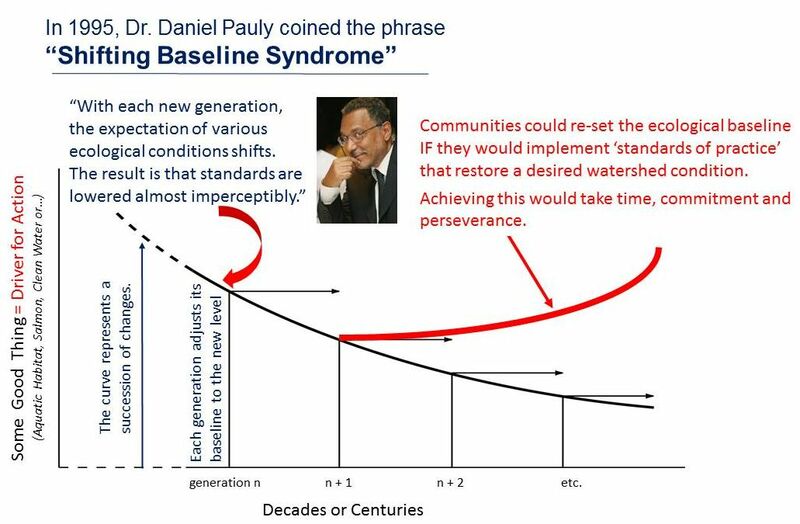 “The analytical approach used in the Water Balance Methodology is verifiable, and allow the mitigation works to be optimized for size and cost while achieving the watershed objectives,” emphasized Jim Dumont.